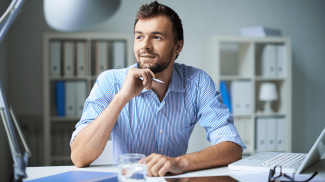 If you want to know what types of businesses prospective entrepreneurs are thinking about starting, take a look at their searches. Here are the types of businesses that people are researching online. There are lots of fashion savvy potential entrepreneurs out there. There are about 8,510 monthly searches on average from those looking to start clothing lines. Restaurants also remain a popular business idea, with 5,940 monthly searches. But some are also looking to start more updated, less expensive food businesses. About 5,570 each month perform searches related to starting food trucks. There are lots of musically inclined entrepreneurs out there as well. 3,080 per month search for information on starting a record label. And others are more interested in building a business where they can take care of kids. There are about 2,370 searches per month related to starting a daycare business. Some business ideas are steadily popular no matter the location. But others tend to be more popular in some states than other. 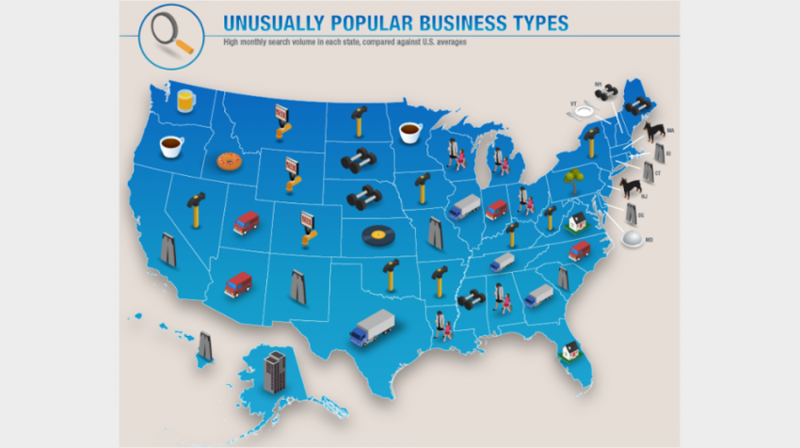 Here are a few of the business types that are unusually popular in certain states or regions. Breweries seem to be popular businesses for people located in western states, especially Montana, Wyoming and Colorado. On the other hand, dog walking seems to be a popular type of business for those in the Northeast, especially Massachussetts and New Jersey. Gyms are also popular with a couple of Northeast states, including Maine and New Hampshire. But there were also a couple of other states with a lot of interest in gyms, like Mississippi, South Dakota and Nebraska. A lot of the businesses included in the infographic were popular with entrepreneurs in more than one state. But Maryland was an outlier. It was the only state where starting a catering business seems to be an especially popular choice. Another outlier, property management seems to be especially popular in Alaska. Of course, sometimes choosing a business is more about profitability than anything else. 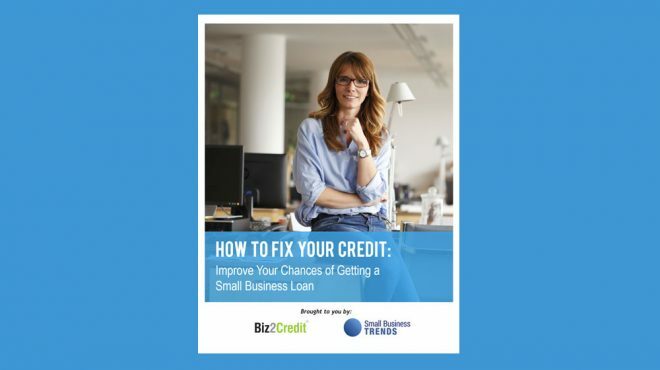 If you’re looking to start a business that can make a lot of money, here are some of the most profitable types of small businesses. Managing money seems to be a good way to make lots of your own. Accounting, tax preparation, bookkeeping and payroll services were named as the most profitable types of business. You can also make lots of profits by managing companies and enterprises. Real estate is another profitable business type that also happens to be popular in a lot of states. For those interested in breaking into the automotive industry, offering equipment rentals and leasing can be a profitable way to do so. And offering legal services, while it does require lots of education and time, is another profitable type of business. And finally, here’s a look at what types of small businesses entrepreneurs are actually starting. As mentioned earlier, bookkeeping is one of the most popular businesses to start. And apparently plenty of entrepreneurs are taking notice, since bookkeeping is the most common type of business being started currently too. Computer repair is another popular business type, since there’s a huge market for those repair services and so many types of devices you can specialize in. Additionally, car repair is an area with a lot of demand and a lot of interest among business owners. Web design gives entrepreneurs a way to work with other business clients and potentially even work from home or remotely. And restaurants, among of the most popular business types in terms of online searches, remain a common business to start as well. You know what they say is the most important factor when it comes to starting a business: location, location, location. So what are the locations where entrepreneurs might want to focus their new business efforts? With a relatively low cost of living and high quality of life, North Carolina ranks as the top state to start a business. Utah is next on the list, mostly thanks to a great labor market and lots of startup activity. Low taxes top the list of reasons why Texas is a great place to start a business. Indiana is another state that ranks highly in terms of the labor market and startup activity. And Montana offers a low cost of living mixed with an active labor market. On the job front, there are also plenty of areas seeing growth. And they might offer insights into growing industries for entrepreneurs as well. It seems that renewable energy is a fast growing field, as wind turbine service technicians were found to be most in demand. Occupational therapy assistants help occupational therapists provide a variety of therapeutic services to individuals who need help performing meaningful activities. Physical therapy is a fast growing niche within the medical field. In fact, it’s growing so quickly that both assistants and aides made it onto the top of the list. And finally, home health aides who provide in-home medical services are also in high demand. It is about time that something like this comes up. It is very important to consider all the locations in the country and how they differ from each other. It is nice to see that it is not just about the location but also the business types as well. This is interesting and is a good case study in case you want to put up a business in a particular location. So it still depends on the location huh? Well, people’s interests vary depending on their culture I guess.